I really enjoyed Lowcountry Punch. Typically southern fiction is not my thing, but it is modern day crime story so it really worked for me. I also liked that I knew of the places (some I've been to) that were mentioned in the book. The whole time I was reading it, I thought this book would make a great television show. In the opening pages, I got a bit of Miami Vice vibe. T. A. Reddick is a DEA undercover agent and the story is told from his point of view. I really liked his character. It is well-rounded. Though he's federal agent, he is all hard and edgy. He has a softer side that you see when he talks about music and art. And boy, does he have women trouble. I think the women trouble is more why I thought it would make great television than the crime he is solving. Can you imagine being in a relationship (or trying to start a relationship) with an undercover agent? That does not mean the story is focused more on his relationships. On the contrary. The drug case is front and center. Boo does a great job of interweaving the characters so that the web of interconnected relationship is not blatant but also not ridiculous. Boo crafts a well-written crime thriller, but it is his characters that really steel the show. You're going to want more, too. Thankfully the ending is left open enough that perhaps Boo will let us revisit Charlestion and T. A. Reddicks wild adventures in crime and love. 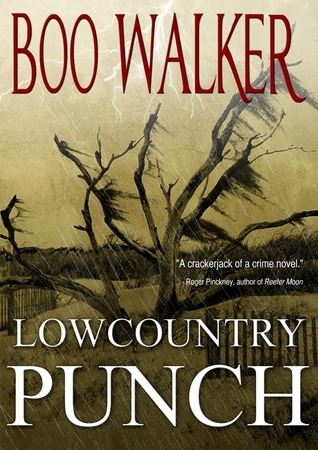 While crime novels are not typically the genre one thinks of as a beach read, Lowcountry Punch would make a great book to read while lounging on the beach or by the pool. I want more of T. A. and his stories of music, women, and crime in the hot and humid lowcountry and so will you. Your turn: What's your favorite crime novel or southern fiction? Do you think a crime novel can make a good "beach read"?